Ready to Install Garage Flooring? Make sure you Read this Checklist! 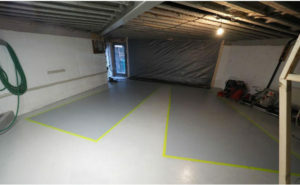 So you’re ready to install garage epoxy flooring, but you’re not quite sure how to go about it. Don’t worry, you’re not alone! The first thing you need to do is make sure that you have the right materials, and that means buying a high quality epoxy flooring. Once you have it properly applied to your floor you will experience a number of different benefits. 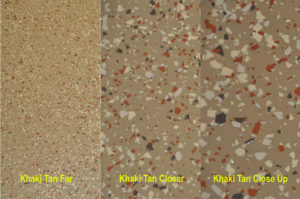 Most notably, your floor is going to look a lot better than it did as just bare concrete. 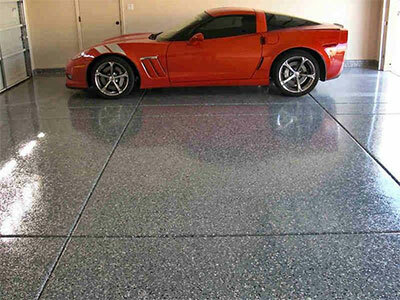 Along with that, it’s going to protect your concrete floor from the elements and harmful vehicle fluids. There are many other benefits, such as greater reflection (it’s going to be brighter), greater resistance to scratching, and of course, easier cleaning. Before you can apply your new flooring however, there are a few things that you will need to get out of the way. Take a look at our checklist and make sure you’re ready to give your floor the upgrade of a lifetime. 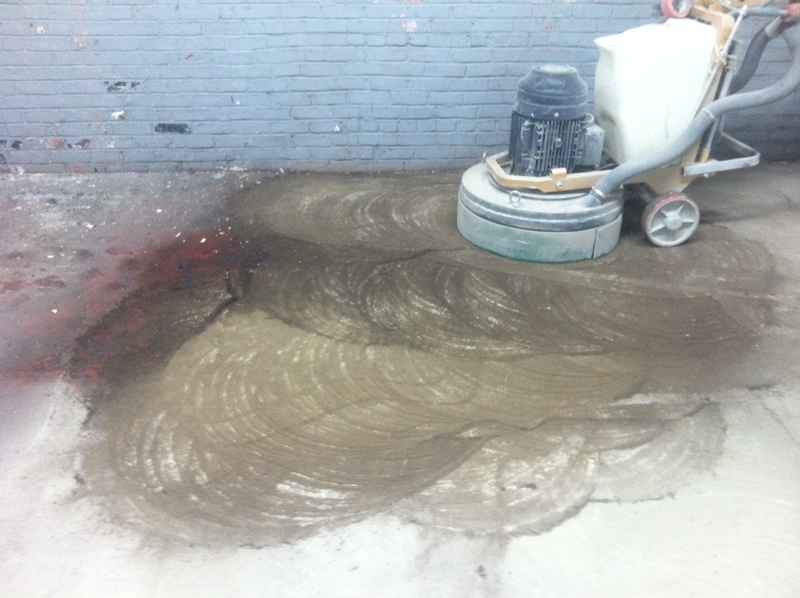 The first and most obvious thing you will want to do is to properly prep your concrete for the new garage floor epoxy. You will need to start by clearing it out, obviously, and then you can move on to the more important business of cleaning it. The idea is to get your floor back to the condition it was in after it was first laid – it’s a bit of a chore but totally worth it. To get it done thoroughly, we strongly recommend that you do a thorough acid etching. It’s a procedure that might take two passes, but it is a critical step to get the proper bond between the epoxy and your floor. Of course if your floor is really dirty and in poor condition, shot blasting or grinding might be needed to get you a better profile. You can also try the combination of a tornado diamond buffing pad and super blue cleaning solution from Concrete Floor Supply Inc.
You need the right tools for the job, and when it comes to epoxy flooring, that means making sure you have rollers (multiples if you are having someone help you), jiffy mixer, duct tape but perhaps the most important, and the most overlooked piece of equipment, is the calibrated squeegee not just a flat squeegee, this helps spread the epoxy at the right thickness. 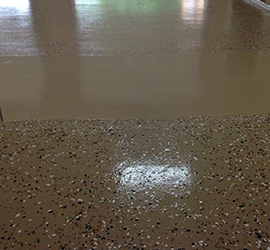 For more detailed application info see our How To Prep and Epoxy Paint Your Floor Page. Make sure you use a good duct tape tape and some Xylene for cleanup. Painter’s tape is too thin for our epoxy, duct tape ensures that you do not inadvertently get epoxy seeping over or through the tape. In most cases, especially with paint, you could simply ‘wipe it off’ if you made a mistake, but our epoxy is a bit different. As we like to say, once it’s on, it’s on. That said, if you make any mistakes, wipe the epoxy clean immediately with Xylene – otherwise you’ll have to sand or grind it off. The biggest mistake people make, aside from forgetting to tape off their walls, is not applying a topcoat. Your floor needs a topcoat for several reasons! First of all, it makes the floor look even better than it would with just a layer of epoxy coating on it since it has a higher gloss finish. Another great reason to apply a topcoat rather than just a clear epoxy is that a real topcoat is much much harder than an epoxy. Remember – epoxy is NOT a topcoat and you can’t make an epoxy into a topcoat by just adding in some UV or other additives like some of our competition claims to do! 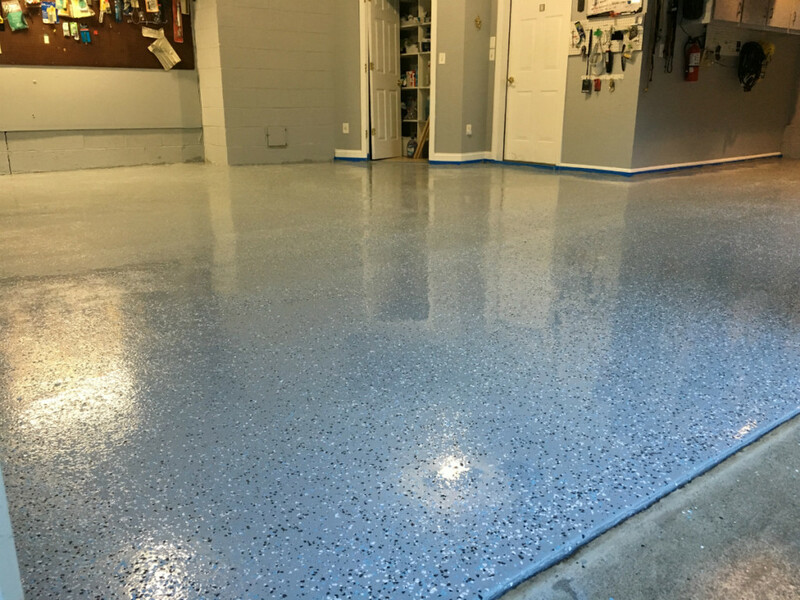 The above information will go a long way toward helping you to successfully apply your epoxy coating, and you will quickly find that your floor is much more enjoyable. Once you have applied your floor coating, however, do try to remember that it’s not completely impervious to damage. It cannot take massive impacts, such as dropping an engine block onto it, but it can should withstand dropped tools and parts. That being said, now would be a great time to start looking into epoxy flooring and making sure that your surface is ready for what’s coming. Remember, a properly applied high quality epoxy coating will last for a long time, and in most cases, for at least ten to twenty years. If taken care of properly, the sky really can be the limit as far as longevity is concerned. The most important piece of advice that we can give you in this regard, is to avoid purchasing discounted or store bought epoxy. Buy the best and reap the benefits for many years to come. If your floor is full of oil stains you need to be very careful on how you prep it before applying any epoxy coating to it. Oil stains are at best difficult to get out and in most cases can be downright impossible to remove. If you have light oil stains you can use our Oil & Grease Remover or similar quality product. You can use Liquid Tide scrubbed in with some Muratic Acid. If either or both those methods fail then you need to use our proprietary Oil Stain Primer . It is specially engineered to actually bond with oil on the molecular level. It is the only way you will get epoxy to stick to your floor. Also if you have stains all over the place we recommend that you prime the whole floor so that you don’t get different color shading in the epoxy since the primer is very dark in color. As you can see above even grinding will sometimes not even remove oil stains. Here the grinder is just spreading the oil all over the place. Lots of times the oil is so deeply embedded into the concrete no matter what you do, you will never get it all out. This is when you clean it up as best you can and then prime the floor with our patented epoxy oil primer and then epoxy paint over that. If you think you were able to clean the floor of all the oil but are not sure cause the concrete may be a little darker where the stain was. Simply sprinkle some water on the spot and see if it beads up or turns a rainbow bluish color. If it doesn’t do either than you’re good to go. If it does either or both you can try cleaning again or go with the primer to be safe.